Cordial Greetings, my most anticipated guests! I hope you are having a fantastic tour along these royal paths of inspiration! Whilst you pass a moment here, I hope you find pleasure in the beautiful and versatile set I have the pleasure to present: Fifth Avenue Floral. 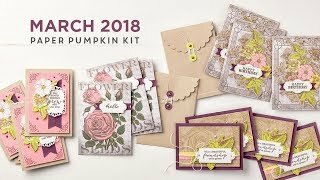 This set bloomed into popularity with several beautiful watercolor techniques, and is a perfect focal point for cards to celebrate birthdays, weddings, births, achievements, or other special days. For holidays, coordinate some beautiful colors and this set adds pizazz! It also can be a beautiful accent for sympathy or remembrance cards, and says "Sorry" ever so sweetly. The most wonderful thing about this stamp set though, is the joyful use beyond cards! Roses are a universal symbol of love, perfect to add to wedding announcements or favors, accessories like the Guest Book or signs, and of course - the Scrapbook! Weddings, Graduations, Sweet Sixteen... dozens of events this set can add a special touch to. And then there are the OTHER two flowers!! The beauty of it - it's not limited to paper! 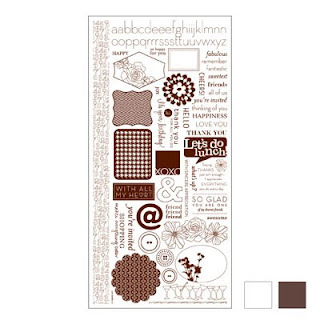 This set has crisp bold lines, great to stamp onto fabric, wood, glass, icing for cupcakes or cakes, pottery... I know you have only a short time with me, so I won't go on (and on, and on!)... suffice it to say this set is AWESOME! It should be at the top of your wish list! Using lighter colors first, layer and build color. In honor of the Royal Blog Tour, I am so pleased to offer you a bit of blog candy as thanks for participating in this most regal tour! please EMAIL ME your name and email address, AND leave a comment here with a bit of Non-Card Creative inspiration: what would you use this stamp for/on (besides a card)? The winner shall be chosen at random, and contacted via email the week after the Tour. I hope you enjoyed your stop at my castle today, it would be most gracious of you to visit again! Enjoy the Tour & Happy Crafting! Great idea on a paint can also and filled with "girly" stuff. This is adorable though and so snazzy! Fun royal tour so far! WOW Angela, the case is fantastic. My have to try that one, thanks so much for sharing. Great ideas! Thanks for the inspriation! How cute! I have to admit it is hard for me to think out of the box and not do cards. This would be great to do on the top of a laptop to jazz it up on on the top of the Clear box storage caddy. Now that really needs something! How smart you are! Love that you used this set in that way. I love that set and need to get it out and play with it. I thought about using the set on shrink film and making earrings out of it. Cute project idea! 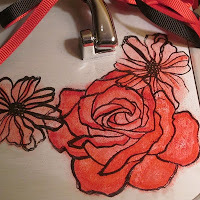 I thought about layering the rose (stamp several times & cut out pieces) on a tissue box. Then, saying 'Hope your smelling the roses soon' or something like that. TFS. That is a lovely make up case and the girl you made it for is going to love it!! I think this set can be used in almost all variations of altering; candles, comp. books, picture frames. My mom loves roses and I can see making her a picture frame. 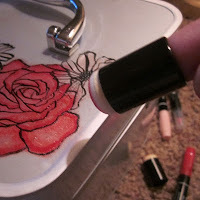 Love this...learned something new about stamping on other things than paper! Great job! lovely use of this set. I have a new nook and use the same style cover as my dh. this would be a cool set to decorate to front of the cover. I am in love!!! I will never look at this stamp set again without seeing your amazing make up box! I have so many ideas now for this set it's not even funny! I think it would make beautiful wall art. And bathroom decor!! And candles......oh my!! Stunning idea! I would use them on a scrapbook page. What a cleaver idea. I too like the diversity of this stamp set. During the summer I had the opportunity to make a lei out of the cut out and colored flowers it turned out really cut. I put plastic beads in between a two sided flower and strung it up with yarn I also had some green leaves intermittently between flowers. Have fun and create something fun. Adorable! I have a 13 year old myself and she would absolutely love this! What a fabulous idea! Love it! Thanks for sharing and for the chance to win. Beautiful box and lucky young lady. TFS! I would use in scrapbooking too! This is such a wonderful idea... I would never have thought of this! I think this set would be amazing to use on kitchen kitchen towels & maybe some placemats for the dining room table! You definitely have my wheels spinning! Really cute!! This is one lucky girl! This would be perfect on a frame, or maybe a silk scarf. I think it is a gorgeous set. Thanks so much for sharing this project. she is sure to love it! Very nice... the recipient is gonna love it! Who wouldn't! TFS! Cute Project Angela! It's always fun to see a stamp used for something besides a card! Love your blog colors and design! Awesome idea! thanks for sharing and a chance to win some blog candy! 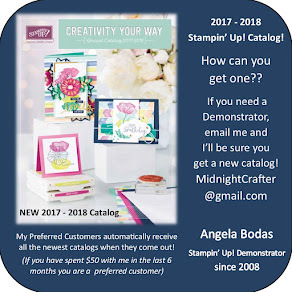 Angela, This stamp set is one of my favorites. I love what you did with it. The Manhattan rose is one of my favourite sets. I love what you did with it! Love it! Very creative! TFS! What a lucky girl to be receiving this cute case. I think the stamp set would look beautiful on a scarf, silk maybe. Thanks for a chance to win some candy. My daughter is an actress currently on tour, but the tour ends Nov. 20th. I'd use this set to dress up her headshot and resume portfolio for her upcoming audition process. Thanks for sharing your project and the opportunity to win some candy! 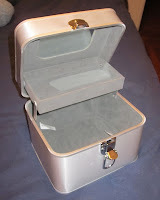 I have used this lovely set for so many things but after seeing this adorable box I thought about using it on candles. There are so many colors that the tissue paper could be colored and once heat set on the candles they would be perfectly delightful gifts! 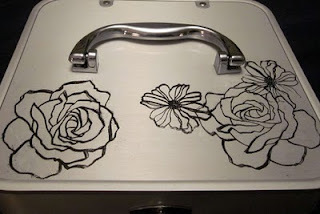 I'd use this set to stamp on a tile to use as a decoration or hotplate -just the outline, or colored in. Thanks for sharing! Love this! I've only used this stamp set for cards, but what a fabulous idea! TFS! I am thinking of stamping on fabric with this stamp set. Loved my visit to your castle and the project was great. Love that stamp set. The make-up case is fantastic.. I've used this set to make a serving tray for a friend. I was surprised how well it turned out. Fabulous!!! Not much more to say except you did a fabulous job. What a great idea......I think I might just be using. Thanks for sharing in my castle. What a great, great idea and I have one granddaughter that just turned 13! I think she would love this. Non-card idea -- hmmm, I think I would try embossing the designs on glass (around the edges) and put a favorite photo or memento inside a shadow box. Wonderful Inspiration for one of my favorite stamp sets. I've been thinking about using this set on a shower curtain just not sure about its permanancy. Maybe with Stazon? Lamp Shades would be cool too. Thanks for sharing the out of the box (or should I say on the box?)idea. Great project! Talk about thinking outside the box! Thanks for sharing your talents on the RBT! Wow! 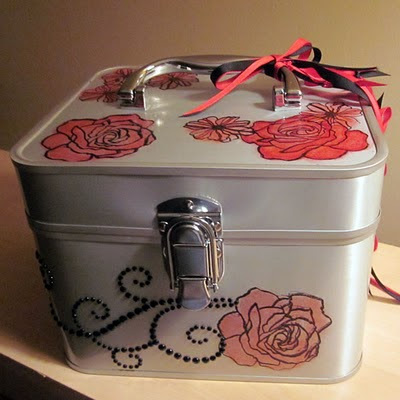 I love your Make-up case idea. I have a couple tween's that this would be a perfect gift for! Let's see... a non-card idea as to how I'd use the rub on's if I won.... I'd incorporate them onto a champaign glass for my daughter's 21st Birthday. She's a wonderful young lady and a special toast from Mom would definately be a keepsake for years to come. This set would be great to use on the cover of a scrapbook or in a piece of wall art. Love the make up box idea! What a terrific project! It's nice to see different uses of the fifth ave stamp set and the bling.....I think I need to break mine out! What a great project - thanks for sharing. I think it would make a great pin - layered with different sections. Awesome project. Thanks for sharing it on the tour and giving us all the info on how you did it. It turned out beautifully! Love your project. That little girl is going to love it. Thanks for being on the tour.